Home › Abundant Living › A Brilliant Disguise? Adam falls like a rock. He not only disobeys a direct order (eat freely of every tree except one – Genesis 2:16-17), but he fails to protect his wife and then presents her as the culprit before admitting his transgression. This after boldly reminding His Maker where she had come from. Nice move. His and Eve’s shame is absolutely manifested by their attempt to hide from God and cover themselves up. A psychologist could have a field day with this one. Adam is hiding from his guilt, his shame, his wrong-doing. His disguise is weak and he clearly doesn’t get away with it. As Adam fell, so have all his sons after him. Cain kills Abel. Abraham is a coward. Isaac’s sons and progeny are deceitful. Moses doubts his destiny. David behaves with brazen risk. Throughout history, kings and peasants alike are not immune from covering up, running from or hiding the truth. We’ve seen examples of how this can play out for us as modern men. Physical or verbal anger and abuse springs from pain, hurt and inner confusion. For many men, they’ve simply checked out. Silence and detachment strike back even unknowingly at objects of love or rejection. Hard-charging workaholics (and alcoholics) chase after goals, peace, comfort, stature or acceptance. In truth their life is a cover-up of sin, shame, pain and lies they’ve never dealt with or they’ve simply acquiesced to a comfortable, implicit agreement with the Enemy (see 7/6/13 Biblical Viewpoint post Living in Spiritual Warfare). I grew up in a blue-collar Hispanic family but in a middle-class neighborhood where everyone’s father, or so it seemed to me, worked as an engineer at Jet Propulsion Laboratory. My father was a produce clerk in the local grocery store. While a good student and athlete, I felt a bit out of step and second-class to everyone around me from elementary through high school and college as they all seemed to have more things and know more things about the world than I did. I pushed through college and graduate school and then into the fast-paced technology world of the Silicon Valley. It wasn’t until years later I realized that I’d been hiding behind achievement amongst “the big boys” in the Valley to prove to everyone (and myself) that I had what it takes, a long-standing doubt in my mind never settled, never fully affirmed by my father, who simply didn’t know how I needed it. In John Eldredge’s profound book, Wild at Heart, he refers to this as “posing” – living behind a façade or a lie. So that’s why we men put up the false fronts of bravado. It’s really out of underlying fear and insecurity – the threat that we actually may not have what it takes. 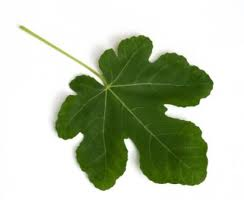 So out comes the fig leaf. So while Adam failed and initiated the separation from our Creator in fear and trepidation, the second Adam; that is, Jesus Christ (see Romans 5; 1 Corinthians 15), restores us back to wholeness. We are redeemed, forgiven, whitewashed clean in spite of a whatever past. In this awareness and love we can now go forth with boldness and without fear. No disguises, no posing, only welcoming forgiveness, freedom and life. Are you hiding? Are you a poser? Have you put down your brilliant disguise?